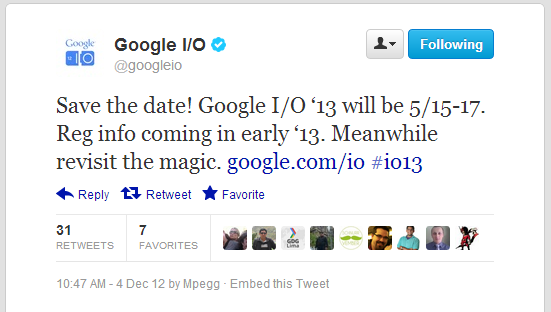 Today, Google has announced the dates for 2013′s Google I/O. Usually taking place at San Francisco’s Moscone Center, the event is scheduled for May 15-17 with early registration beginning sometime early 2013. Last year, we were introduced to the Nexus 7, Nexus Q, and Jelly Bean. Those who have been paying attention over the last couple of years will know that I/O typically sees the launch of a new version of Android as well as some free gifts given out to developers. At I/O 2012, we met Jelly Bean for the first time, the waiting list for Google Glass was announced (a product that should be in people's hands by the next I/O) and attendees received a free Galaxy Nexus, Nexus 7, and Nexus Q. This year, can we expect some Key Lime Pie? Sid Goswami is a tech enthusiast, besides being an avid Android fan and blogger, Sid wants to be aphotographer and a designer. He can usually be found reading through blogs, taking photos. He's a student and a PHP web developer.